Do you have you set your heart on a wedding on the beach? Would you like the memories of your big day to involve sand, sea and many happy moments? Then this blog post is for you! 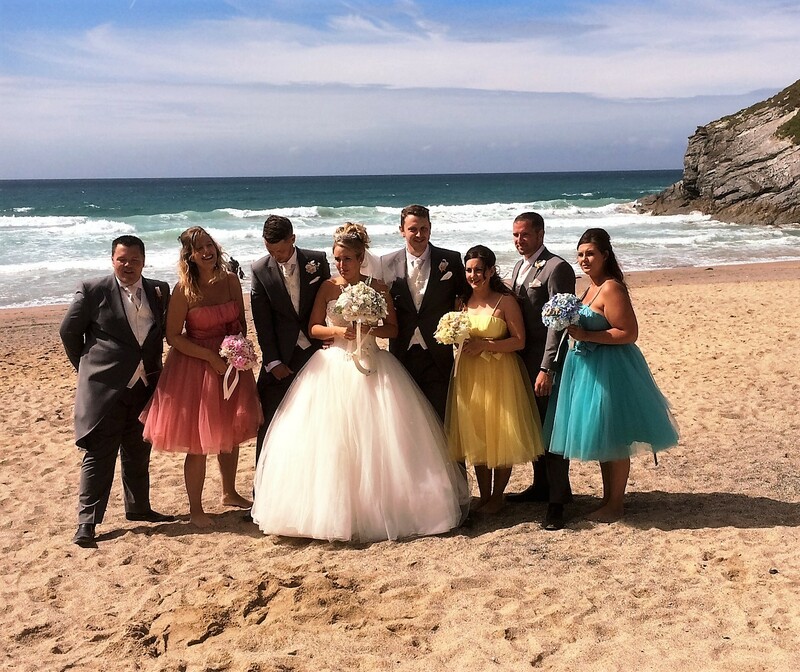 The Guild of Cornish Celebrants are based in one of the UK’s most popular counties for weddings, Cornwall. And I am sure it is no surprise to hear that we are spoilt for choice with the wide selection of beautiful, romantic and often quite dramatic coastal ceremony locations. Whether you choose the sun brushed white sandy beaches on Cornwall’s South Coast, the rock tumbling cove’s and hidden beaches on the Westernmost peninsula or the soft sandy beaches that edge the North Coast, you really do have a variety of beach ceremony locations. Having worked with clients from around the world, creating with each their own bespoke celebration, we thought we would share with you the most essential things to consider when creating your beach ceremony. When considering potential ceremony locations you need to think about things like the distance from the car park or road to the beach for loading and unloading, is it easy to find or will it require signage, where would be best to set-up on the beach and will there be enough space on the beach if it is your date is in the summer school holidays? Do you have any disabled guests or elderly family members that you would like to attend and how would they access the beach? If you are not from the area but would really le to find the perfect location then we can assist by working with you, listening to what you would like and matching it up with our knowledge of the area. We can also advise on the logistics of that setting and how you could make it work. On your invitations let your guests know that it is a beach ceremony so that they can dress appropriately for the day. Don’t just assume you can have your ceremony on any beach on any day, some beaches are privately owned and you will need the land owner’s permission and probably need to agree the fees and dates. The choice is yours – from the traditional to a more modern approach. The key to the ceremony is to have what suits you both. The best ceremonies add a little humour with meaningful and heart felt vows, with rituals added it that feel “right” for you both. Be open and honest with each other about what you want out of the ceremony – it should be at the heart of the day. The length of the ceremony is a matter of personal preference – it needs to be long enough to feel momentous but not so long that your guests start to get restive. We would suggest that 30-40 minutes works really well. You will most likely need some furniture for your ceremony, whether you choose to just have an open gazebo structure or seated ceremony set-up you do need to consider how your suppliers can get them to your location, whether they could set them up for you and the time/ cost impact this may have. It is also important to consider the comfort of you and your guests, will you need shade from the sun or shelter from the wind? Now this is a biggie, ensure you have checked the tide times when setting your date and time. Without this key bit of preparation you could easily end up with a ceremony in the sea rather than with sea views. When it comes to the weather we would tentatively look at the forecast a week ahead and then again the day prior to make the necessary arrangements. We advise our clients to have a ‘dry’ and a ‘wet’ weather plan in the very early stages of our journey with them, so that all eventualities are covered. If it’s too sunny you may have a sunscreen & water station, with parasols for guests and if it’s raining perhaps a pop up gazebo, wellies and umbrellas. Thinking ahead and having a back-up plan will allow you to relax and enjoy on the day itself.